It is good that you can export (and import) sync settings for each device. Unfortunately not all information is included there. I´d love to see that also the auto-sync settings would be saved, especially the selection of playlists which should be synced. The reason for this request is that my Sony Walkman NW-A35 tends to get new names for its SD-card in the available devices list and then I need to adjust the sync settings again. It would be great if I could copy just all the settings from one device name to another. Great suggestion Snofru - and I can see why you make it, as a new owner of the Sony NW-A-35 today. I'm having an issue with it, and wonder if you or anyone else on this forum will be able to help. I have an NW-A35 with a 200GB Micro SD card as an alternative to my (now faulty) 160 iPod Classic. I'm trying it out today, but playlists I sync from MediaMonkey to the device appear as having '0' tracks, and I don't know how to fix this. I've migrated my iTunes library (21,000 tracks) to MediaMonkey and have been test syncing a 10 track playlist over to the NW-A35, with the tracks being auto-converted down to 192kbps. All the tracks have been sent over to the NW-A35's SD card and play sucessfully. I have the m3u playist saved in a 'Playlists Folder', also within the 'MUSIC' folder on the SD card. The playlist appears on the device, but shows as having '0' tracks (and also has 'Not editable' in light grey wrtten next to it - not sure if this is relevent). #EXTINF:265,The Flaming Lips - How?? 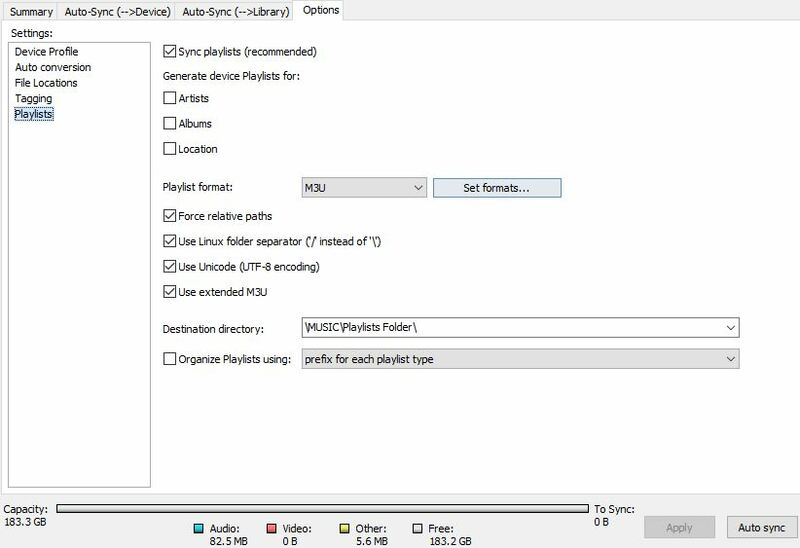 I've sent over playlists with all the different settings enabled and disabled (relevent paths, Linux separator, UTF-8, extended m3u), but none of the option combinations make the device see the tracks in the playlist. Getting this to work will determine whether I keep the device or send it back - asI don't want to use Son'ys horrid Media Go or Music Center software as my library management software! So, how do you get readable playlists over to the NW-A35 from MediaMonkey? Thanks in advance for any assistance! Try to Use only "\MUSIC\" as Destination and then retry with disabled UTF8 and/or Extended M3U disabled? In my settings I have "\MUSIC\Playlists\" as my destination folder. I had to try out a few settings before I found that this one works (for me). Apart from that I have checked "Sync playlists" and "Use Unicode (UTF-8 encoding)" and everything else is unchecked. BTW: This discussion would make more sense in a separate thread, IMHO.